The Multiple Components in One Database (MCOD) feature of SAP enables a reduction in the number of DB2 systems that need to be installed and maintained. This significantly simplifies overall database administration and is considered one of the major DB2 competitive advantages. 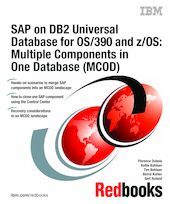 This IBM Redbooks publication will help systems administrators, database administrators, managers, and operation staff to plan, implement, and administer an SAP MCOD landscape with DB2 Universal Database (UDB) for OS/390 and z/OS as the database management system. We describe how to merge existing systems into a single DB2 subsystem. Two different methods are developed, each of them addressing different needs. For small-to-medium SAP systems where high availability is not a requirement, we explain how to use SAP tools. For large systems, where the down time needed by SAP standard procedures is not acceptable, we document a technique to merge SAP components without moving the data. We also provide a cloning procedure using the Control Center. We show how to clone one component out of an MCOD landscape. We address the backup and recovery implications in an MCOD environment, to help database administrators plan accordingly. We also describe how to set up and use the Computer Center Management System (CCMS) in an MCOD landscape.